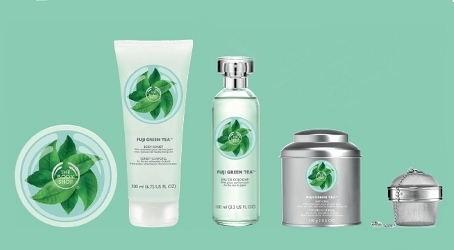 The Body Shop has launched Fuji Green Tea, a bath and body fragrance collection. Fuji Green Tea uses green tea from Fuji Mountain and the fresh scent aims to 'revive your senses'. Notes include green tea, bergamot, lemon, mandarin, camellia, jasmine and violet. The Body Shop Fuji Green Tea is available in 100 ml Eau de Cologne and in a variety of bath and body products (shown left to right are the Body Butter, Body Sorbet, Eau de Cologne, Bath Tea and Bath Infuser, but there is also a bar soap, scrub, body wash and body lotion). Sounds like it could be great. Their body butters are really nice. Yes, that’s what I’m interested in…not sure what the “body sorbet” formula is but I’ll try that too. I think the body sorbet is a very light, refreshing lotion from what I’ve heard. Never tried it though. The Body Sorbet is going to be a water-based lotion. This is what makes it so light and refreshing!